We are grateful for your interest in high school at BRCS. 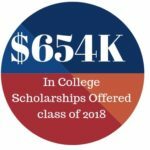 Please contact Upper School Principal Eric Codding, or Guidance Counselor Mary Beth Anderson with any questions about our program, and also read our Statement of Faith, along with our Graduation Requirements. Academic and college counseling services are provided beginning with class selection for the freshman year and continues, via individual and group guidance, until the student has completed the college application and acceptance process as a senior. To help students stay on track toward their goals, information on required testing and course work is regularly provided. Honors Courses are offered across grade levels for most core subjects. 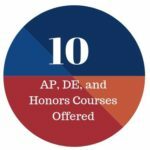 Advanced placement (AP) courses are offered based on student interest and enrollment. AP English is currently offered. Dual Enrollment courses are offered based on student interest and enrollment. 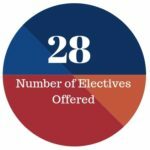 US History 221 and 222 were offered in the 2016-2017 school year. MTH 173: Calculus with Analytic Geometry was available for the 2017-18 school year. What is the mean class size? The mean class size for core subjects is 12. Elective mean average is 10. Fall Fling is a student-organized event that encourages social relationships for our students in a safe setting. Relationship guidelines as well as guest and dress policies ensure healthy and enjoyable experiences. The Jr/Sr Banquet is a formal event, for juniors and seniors, held in the spring. Students decorate and enjoy food, fellowship, and a lot of fun. Every other year students have the opportunity to travel to La Colonia in Guatemala. The students create their own Bible School curriculum, visit orphanages, and assist with building projects. 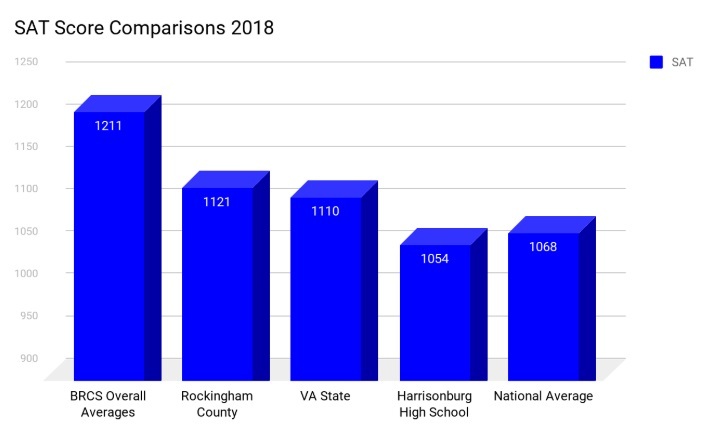 The Class of 2018 had an average of 1217. The average math score was 583 and the average reading and writing score was 633. Is there a Student Government Association? Yes. Student Government provides an excellent way for students to develop leadership skills while they channel enthusiasm for their school into planning and promoting events like Fall Fling and the Student Banquet. Is service a planned focus of BRCS? Giving back to the community is important. Beyond service events, BRCS promotes opportunities to engage students from area schools and churches. Intramural sports teams bring students from area high schools together to play in an encouraging and God-honoring environment. 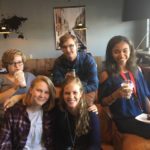 BRCS high school students also led a nine-week Alpha course which brought area teens together through food and discussion to explore the Christian faith. Our Heart & S.O.U.L. program gives high school students an understanding of the Heart of God, by being a part of His greater kingdom through Service, Outreach, Uplift and Love. We learn from Christ’s example and through His teaching that a walk with Christ must include compassionate outreach to others, especially to those who are less fortunate. Students accumulate Heart and S.O.U.L service hours and reflect on their experiences in their Bible classes. Are students eligible for National Honor Society? Yes, National Honor Society Membership is earned through effective demonstration of four key qualities: Scholarship, Service, Leadership, and Character. High school students inducted have earned a minimum 3.5 GPA. In monthly symposiums, guest speakers share about their lives and professional careers, with an emphasis on living out their faith. Symposium speakers also include college representatives. Chapel meets on Thursdays. High school worship teams lead in praise and local pastors, missionaries, and other special guests share a message. Once a month the students meet with faculty members in Spur Groups (Heb. 10:24) for personal accountability, prayer, and Bible study. Technology is integrated throughout our program. 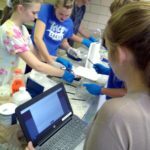 BRCS makes use of Google Apps for Education, which provides online word processing, spreadsheets, and presentation applications, and all high school students use Chromebooks. Internet filtering is in place on each campus, and a biblical ethic is emphasized for all online communication and research. The faculty work with each resource student’s individual plan. If the student qualifies for services through Rockingham County, a tutor is provided. An extra study hall for assistance from with an available teacher is often incorporated into student schedules, and technological enhancements such as talk to text can be utilized. 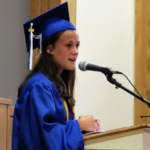 Blue Ridge Christian School accepts credits from vocational centers toward our high school graduation requirements. We recognize the value in learning and experiencing a trade to prepare students to enter the workforce after graduation.